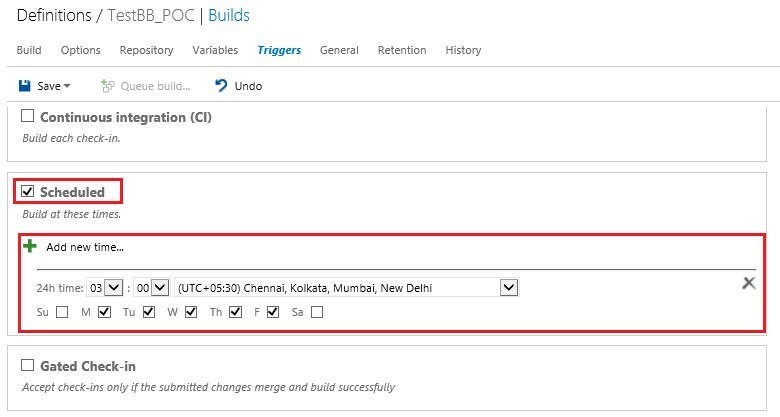 A Build definition may be defined as a collection of steps/tasks which can be executed in a sequence as specified while creating a build definition. We can change a sequence of steps added in the build definition by dragging on the desired place of execution. There are various tasks provided for adding in the build definition. In my previous articles, I explained about Build Agent: How to install, configure, and unconfigure a build agent in TFS 2015. To see the previous articles, click here. Tasks/Steps used in the build definition. Let’s create a new build definition for a simple web application. And in my next article, I’ll explain about release definition. 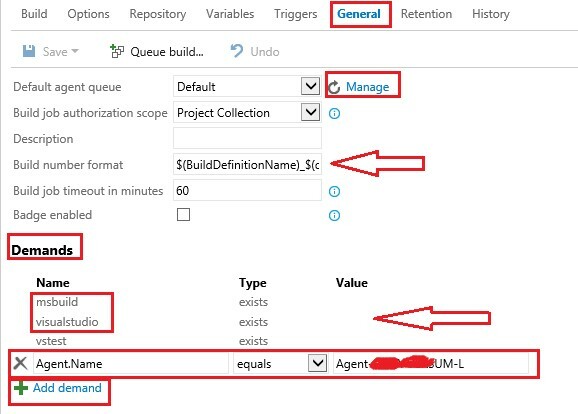 A Build definition may be defined as a collection of steps/tasks which can be executed in a sequence as specified while creating a build definition. We can change the sequence of steps added in the build definition by dragging on the desired place of execution. There are various tasks provided for adding in the build definition. For example, there are tasks available to build, test, deploy. These tasks can be added in the build definition. Below is a screenshot of adding tasks as per your build definition. We can select any number of tasks in the build definition. 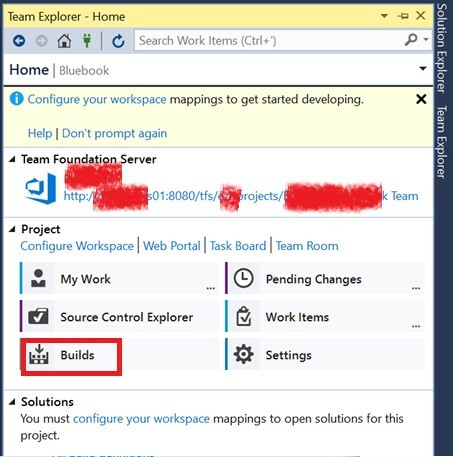 To get started, select the project from projects collection in TFS server and click on the Builds link in Visual Studio Team Explorer. 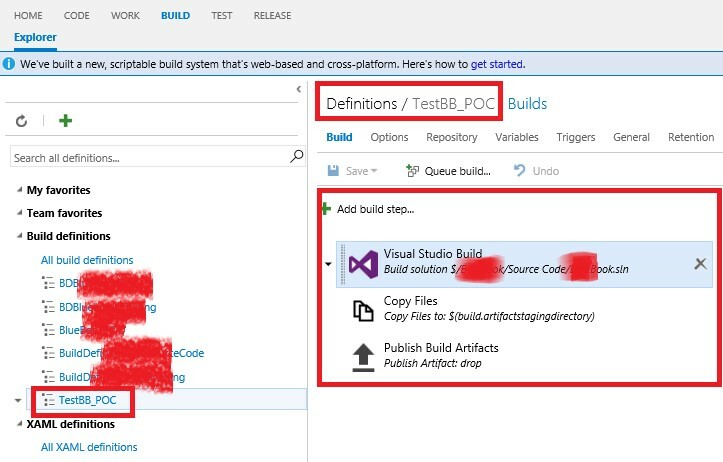 To create a new build definition Click on New Build Definition option OR View Builds to see all builds created from Visual Studio and you will get the following screen as shown in the below figure. You can create a build for Windows or on Linux also as step(s). 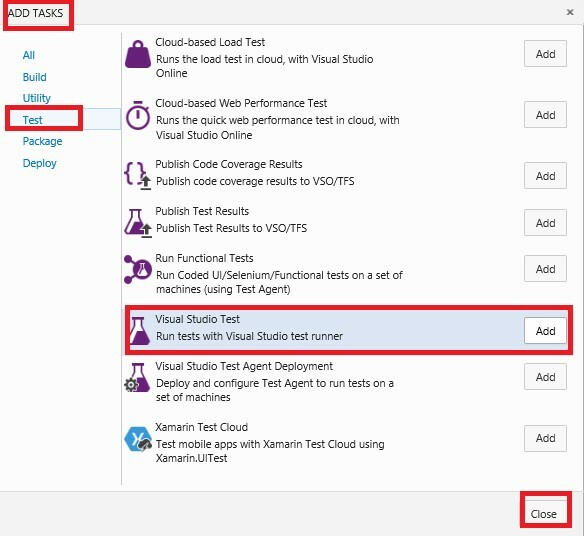 Click on the button and select Visual Studio template (This template requires that Visual Studio be installed on the build agent. (To read more about build Agent read here). With Visual Studio Online definition, templates are also available. You can create your own templates too. Select the repository source, you can select the project from team projects, GitHub and SVN. Check the continuous integration trigger if you want to queue the build on every code check-in. A continuous integration trigger on a build definition shows that the system should automatically queue a new build whenever a code change is checked-in. We will discuss about this in Triggers tab of build Menu later in this article. See more on Build triggers. Then, select the agent queues. Here, I used the default one and click on "Create". 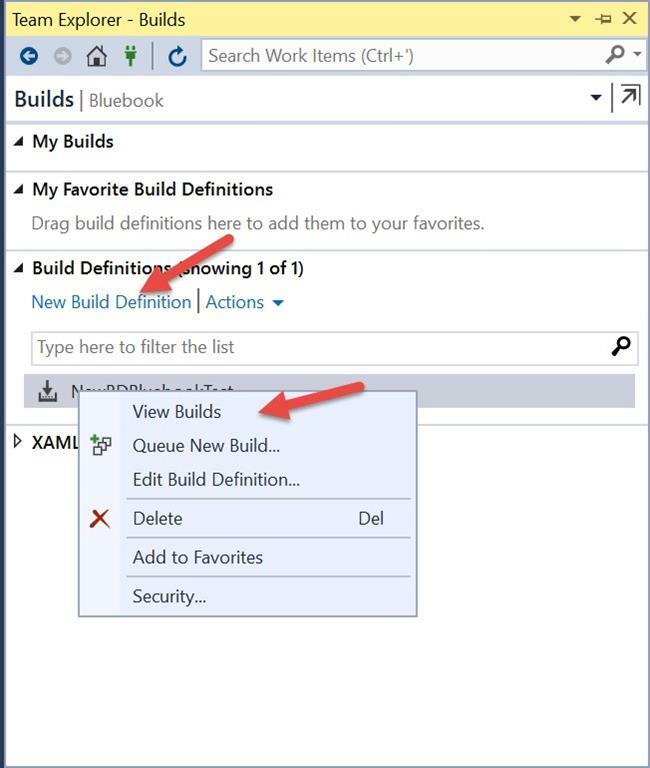 A new build definition is created with default Build Steps. You can add new tasks included in the build by using the “Add Build step” option just below the save button. A new “Add Tasks” window will open select the step you would like to add and click on "Close". 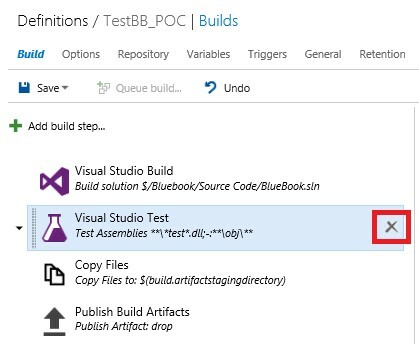 Click on the symbol to remove the task from the build definition as shown below. Click on save, to save the build definition Name and add comments (if any). I used below the Build steps for my build definition. Using this task we are able to specify the solution, platform, configuration, Visual Studio version etc for the build definition. Select the task on the left side and set the properties on the right side as shown. Platform: It provides these options to choose for build - Win32, x86, x64 or any cpu. 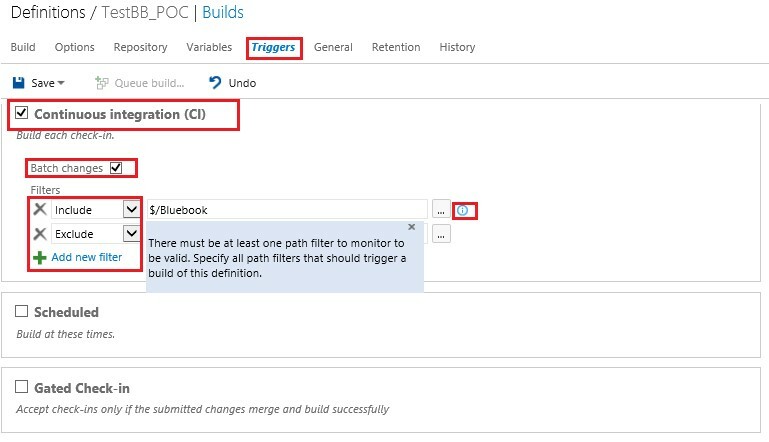 Configuration: Lets you set the configuration for your build such as debug or release. For information on the particular step setting, click on blue info icon. To read more about this step, click here. This task can be used in a build to copy files from a source folder to a target folder. We can use a custom variable to specify the source folder path. In this step, the source folder is $(build.sourcedirectory) under Agent’s _work folder. s = source directory and a= artifact staging directory. To know more about this task read here. This task can be used in a build to publish build Artifacts to TFS, or a file share, as specified in the information shown below. Specify Path to the folder or file you want to publish. Using this task, we can specify the folder on the network and after build it publishes the files in this folder and from here, we can use these publish build Artifacts as the source for the Release definition. I selected file share and for this, specify the path to the file share where you want to copy the files. The path must be a fully-qualified path or a valid path relative to the root directory of your repository. Publishing artifacts from a Linux or macOS agent to a file share is not supported. The Build definition contains various options, as we can see in the below screenshot. Use the +Add build Step... button add the steps in your build definition. This option can be used to build multiple configurations such as configuration on both x86 and x64 platforms. This option from Options tab helps in building selected solutions multiple times. For that, we can add comma separated list of configuration variables here. These variables are listed in the variables tab which we will discuss later in this section. You can find a list of predefined variables here. The Parallel check box, provides all the combinations in parallel. The pre-condition is that there should be multiple agents available to run. 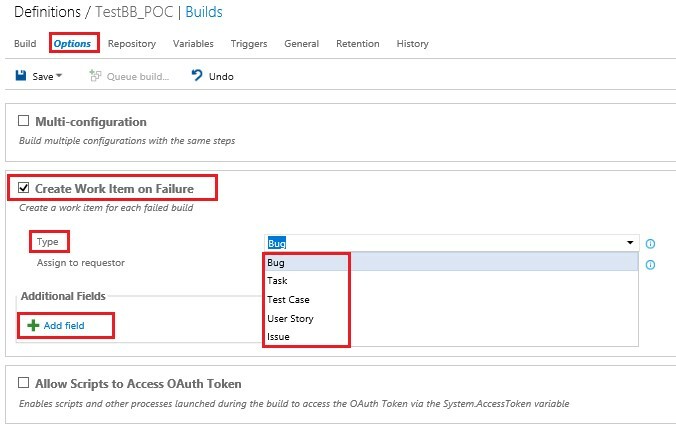 This option can be used to automatically create a work item when the build fails due to any reason. The work item can be of Bug, Task, Test case, User story and Issue type. Assign to Requestor option can be used to assign the work item to the requestor. And using +Add field we can add an additional field when creating the work item, as shown in the comment. We can specify Repository type, source path and local path mappings, and add new mappings using this tab. At the beginning of the build process, the agent downloads files from your remote repository into a local sources directory on an agent. For example, in the below build, the server path is mapped to the local path under mappings section. The Server paths can be mapped with a local path. We can add mappings using Add Mapping link as shown above. Using this tab, we can add variables which can be used in the build definition. Variables can store and share key bits of data in your build definition. Some build templates automatically define some variables for you. 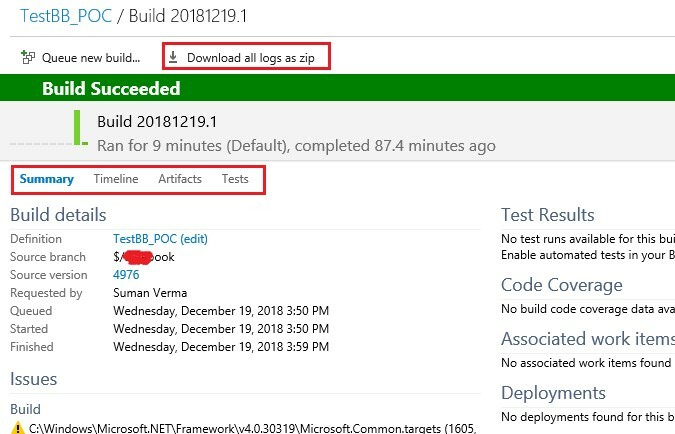 Ex - when you create a new .NET application build, BuildConfiguration and BuildPlatform are automatically defined for you. You can also add your own variables which can be used in the build definition. So, if you want to use your variable in the build definition, we have to specify it as per the above syntax. 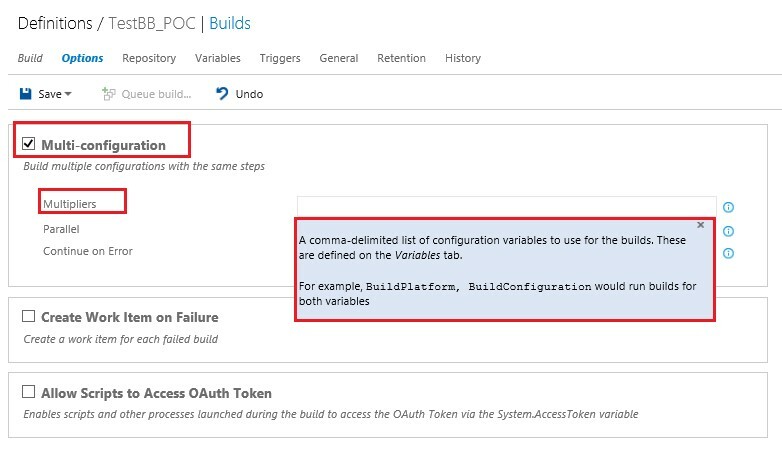 For example, in the Build definition Task, we used these variables as $(buildConfiguration), as shown below. In the same way, you can use your own variables. To know more about variables, click here. Using this tab we can schedule the build, build with each check-in or with gated check-ins. Triggers available are - Continuous Integration, Scheduled and gated check-in. CI (Continuous Integration) - Select this trigger if you want the build to run whenever someone checks in code. Checked Continuous Integration and provide the path of the solution for which Continuous Integration is build. We can add filters as well to include and exclude any file/path. We can also schedule the build using Scheduled Trigger, specify the time at which you want the build to run. To know more detail about triggers please click here. 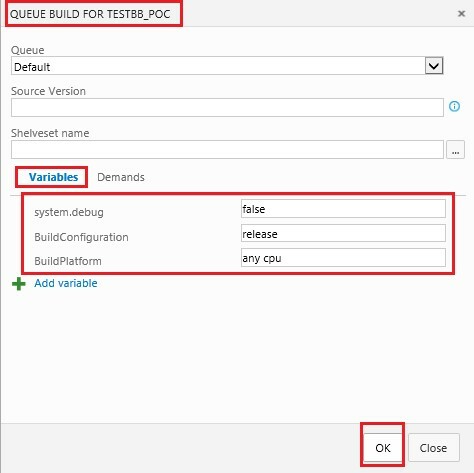 Build number format – what name you want for your build or the name of the folder under which queued build will be placed. 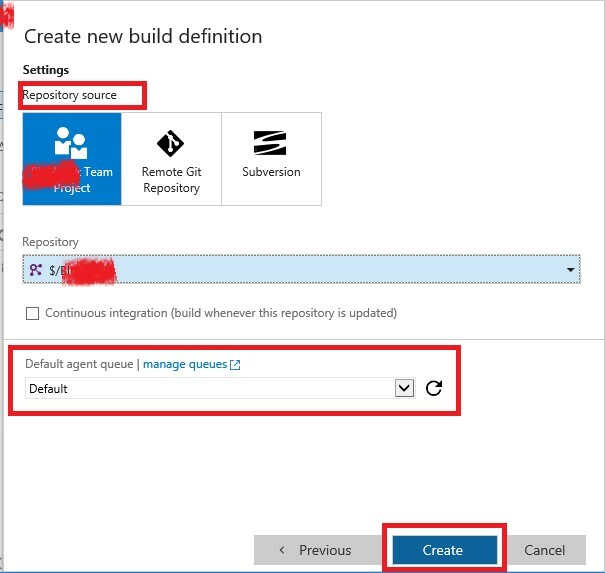 Make sure that the capabilities your build needs are present on the build agents that run it. Demands are added automatically by build steps or we can also add Demands manually using Add demand button. Some build steps won't run unless one or more demands are met by the build agent. 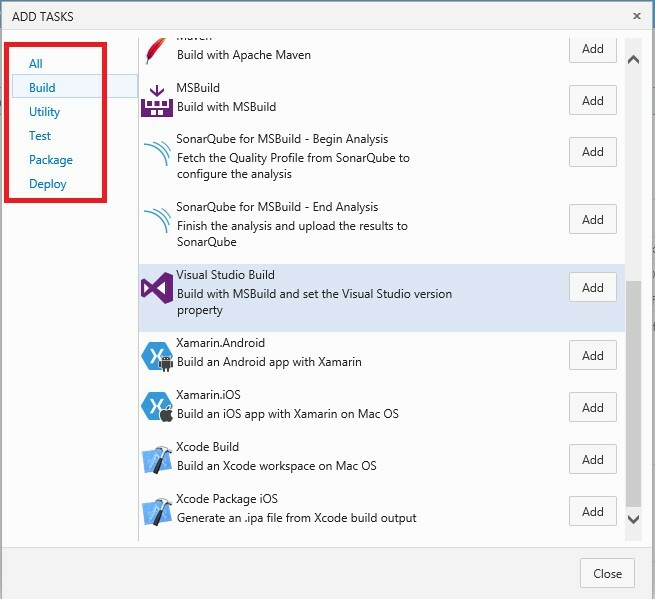 For example, the Visual Studio Build step required that "msbuild” and “visualstudio” are installed on the build agent. If your build includes steps that have demands, they are listed first. We can specify additional demands like choosing a specific agent by adding a demand as “Agent.Name” as shown above. 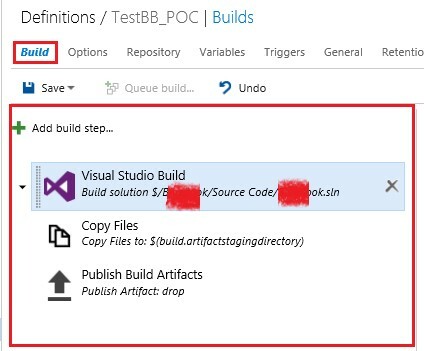 if the "msbuild" and "visualstudio" are not present on the build agent, and in our build definition we added "Visual Studio Build" Task, It will show a message that capabilities are not present on the agent. Retention tab as the name says, allows to see the duration to keep the build and a minimum number of build to keep. It also allows us to set or edit maximum build retention policy. History tab allows to see any changes in the build definition. It also shows the information like changed By, Changed date, Change Type and comment. Save the build definition by clicking on the Save button. Specify the comment, if any, and click on OK. 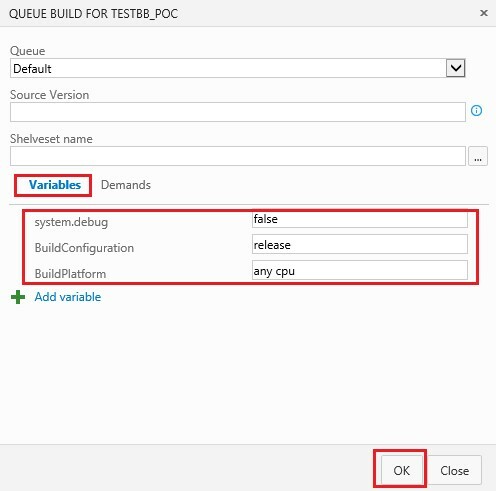 Build definition is saved and now Queue build option is enabled which means we can build the task steps. 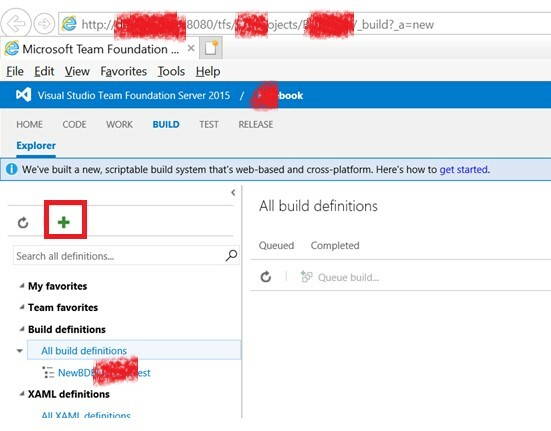 Build has started and the build tasks are executing as specified in the build definition. The agent downloads all the resources to the local path mapped to the server path and then executes the steps as mentioned in the build definition. Build has succeeded with all the steps. We can see the console for the build tasks and explore logs using Logs as shown below. On the agent Machine, we can see the folders specified in the Repository tab are created and we can see the _work/2/s path in the logs of the build. And the Build Artifacts are published on the specified location as we set in the Publish Build Artifacts step. The TestDrop folder created as specified on the File Share path. We can see build details such as build definition name, source branch, any test resuls source version etc. as shown below in this tab. This tab can be used to display build steps, agent name and the duration takes place when executing each step as shown. We can use this tab to explore the build Artifacts as we setup in the Publish Build Artifacts step. We can use the build Artifacts produced by the Build definition in the release definition. I’ll explain in my next article about the Release definition for different environments and the steps included in the Release definition. 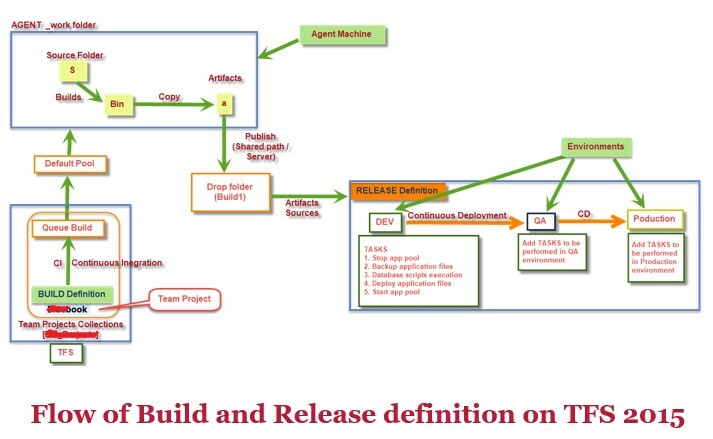 Below is a flow of the work of build, release definition, and agent.